A PAL Digital U.N.I.Verse.City workstation. If you’re a forty-something like me, computer classes in high school involved learning to program in ASCII or DOS on a monochrome screen. If you attended college, there may have been more advanced computer classes, for which you likely moved and stored content on floppy disks. After college, you used a PC running some version of Windows at the job, and computer proficiency meant that you knew how to use Microsoft’s Office Suite. You’re up on the latest gadgets, even if you don’t own an iPad or mobile tablet. You probably have a smartphone, a laptop and an mp3 player. And you probably consider yourself pretty savvy when it comes to digital technology. Today’s youth are exposed to technology, not as a stiff class taught by some bored out-of-touch professor, but as a natural extension of their everyday existence. Their access to and adoption of technological gadgets, is second nature to them, almost intuitive. And unlike us, who came into the ‘technological age’ of massive building-size ‘super computers,’ today’s youth have microprocessors in virtually every device they touch. The Macbook Pros, Xboxes, Playstations, Wiis, Leapsters of today are tens of thousand times more powerful than anything we ever used growing up. With Facebook, Twitter, texting, etc., kids are more immersed in interactive technology and applications than we ever were. They can access and touch virtually any part of the digital universe, and regularly use technology to communicate, socialize and interact with one-another and others. This intimacy, however, has it’s consequences, though. Cyber-bullying, internet plagiarism, and the regular posting of questionable (and often inappropriate) content are norms, that we didn’t experience when we were using computers and cell phones. Social media, as we know it today, didn’t even exist. It’s no wonder that kids are acting…like kids, when they use them these different tools. I think it’s important that we take stock of what our children are exposed to (from a digital, content and technological perspective), and give them real guidance on the appropriate and responsible use of technology. To that end, I want to share a project that I’ve been working on with the Police Athletic League of New York City (PALNYC). It’s called the PAL Digital Digital U.N.I.Verse.City and its a class being offered as part of an apprenticeship program. The apprenticeship program is the initiative of Marcel Braithwaite, the Director of Centers for PALNYC. Marcel manages PALNYC’s eleven (11) centers, located in the five boroughs of New York City. And he wanted to develop a program that exposed kids to technology as a means of both skills/workforce development and keeping them off the streets. The curriculum we are using for the program was developed by Mark Hines, a graduate of Princeton University, and the CEO and Founder of Marksmen Productions, Inc., a New York city-based creative agency. Mark has designed a program that teaches real life skills to the youth, using live scenarios which give the students active participation in projects with real time results. The Digital U.N.I.Verse.City (DU) is a six (6) month intensive audio, video and technology training program, tailored to students of varying degrees of technical proficiency. Digital U.N.I.Verse.City classes meet two (2) times a week to provide students instruction in digital media production, it’s cultural impacts and ethical and moral responsibilities that accompany the use of these tools. The program officially launches next Wednesday at the Harlem Center on 119th Street, and Digital Uni.Verse.City students will study media (news, tv, movies, music, art), how it is produced, and begin rudimentary hands-on manipulation of video and audio (DU101/102) in preparation for the Advanced Studio Workshop (DU201). 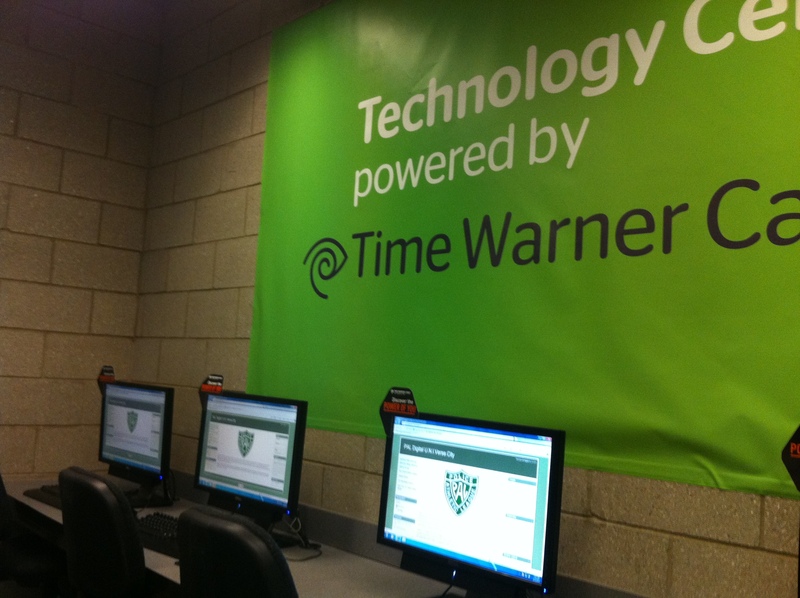 The Time Warner Center in the Harlem Center has been converted into the PAL Digital U.N.I.Verse.City classroom. Students who successfully complete the intro courses will be invited to participate in the Advanced Studio Workshop, focusing on professional skill development in (one of the following) music production, audio/visual engineering, video production and direction, video editing, motion effects, journalism and musicianship. Digital U.N.I.Verse.City instructors include many of our professional colleagues, who are experts in their respective fields. From Grammy-winning musicians, to New York Times best-selling authors, the Digital U.N.I.Verse.City instructors will offer students hands-on training and skill development on live projects. The Digital U.N.I.Verse.City curriculum starts with a review of the DU Acceptable Use Policy, which lays out the foundation for every student’s participation in the program. Most people have never seen (much less read) an acceptable use policy. But it is the most important thing, for people living in a highly interconnected digital world – and the point of this rambling post. I helped to develop (read: wrote) our acceptable use policy, which came together after many long sessions, during which we worked diligently to draft something that actually made sense. For the majority of people who have ever read (read: scanned) an AU Policy, you know its a statement by the owners, administrators or other gatekeepers of any digital or online environment, which provides a code of conduct that users must observe while utilizing (or as a member of) a particular system. As an advocate for technology, the Digital U.N.I.Verse.City program, gives me a constructive way to address the issue of responsible use of technology by our youth. More importantly, working on this project has forced me to address the fact that most of us operate without a set of guiding digital principles. But that’s not quite the same thing, when the audience for my usual written verbosity is the youth. Next Wednesday is our first class (did I say that already?) and I’m excited. 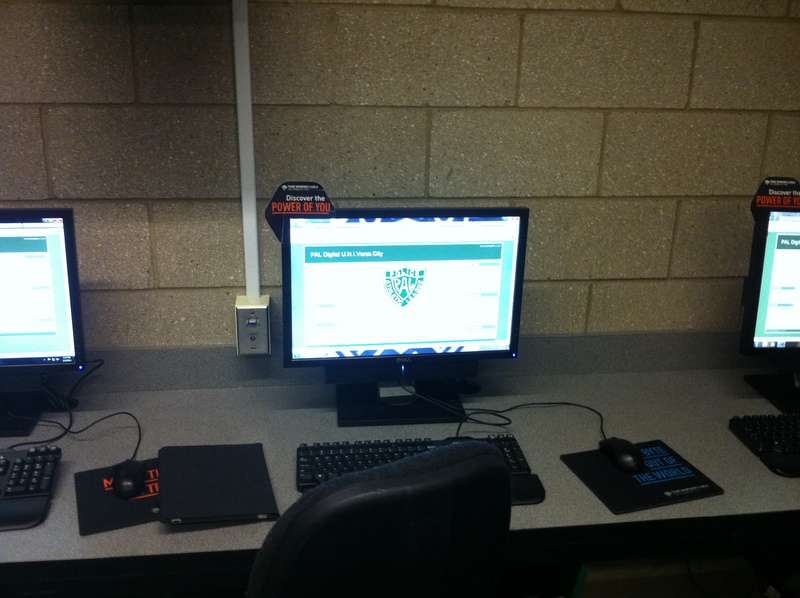 The pictures above were from our dry-run, when we set up the local Moodle we’re using for the class. Be sure to look out for future posts about how the program is coming along. Also, feel free to donate to or volunteer at your local PAL!